TIEZA office, 142 Amorsolo St., Legazpi Village, Makati City (this office is now closed). *Please note: As of March 1, 2018, the TIEZA Central Office has been operating at the 6th & 7th Floors of Tower 1 Double Dragon, Meridian Tower, Diosdado Macapagal Ave. cor. EDSA Extension, Pasay City. The Makati office is now closed. If you’ve ever traveled overseas then you’ve had to pay the Philippine travel tax at some point before your departure. The standard travel tax is P1620 for adults flying economy class, while children aged 2-11 are entitled to a reduced travel tax rate of P810. On the other hand, infants (up to their 2nd birthday on the date of travel) enjoy travel tax exemption. Other classes of travelers, including OFWs and their dependents, are entitled to either tax exemption or a privileged reduced travel tax, whatever the case may be. For more information about the Philippine travel tax, visit the Tourism Infrastructure and Enterprise Zone Authority (TIEZA) web site. Depending on which airline you’re flying, tickets purchased online may or may not include the Philippine travel tax. Philippine Airlines, for instance, will add the travel tax if the passenger/s is an adult or a group of adults. If the booking includes a child passenger, no travel tax charges will be made on the e-ticket, so the tax will have to be paid at the airport. Air Asia gives travelers the option to pay for the travel tax when booking online; declining the offer means you’re choosing to settle it at the airport. If a child is included in the traveling party, it’s best to pay the tax at the airport, where the reduced travel tax privilege may be availed. TIEZA Makati City office (This office has moved to Pasay City. If you’re booking and paying for your air tickets through an airline ticketing agency or travel agent, you’ll have to pay the travel tax upfront. The travel tax will then be remitted to the TIEZA office by the airline. What many travelers don’t know is that the airline or agent will only honor a tax exemption or reduced tax privilege when you present a certification from the TIEZA. Without a tax exemption or reduced travel tax certificate from TIEZA, you’ll be paying the default rate of P1620 (economy-class) per passenger, in which case your only recourse for availing of the special tax rate is to apply for a refund from TIEZA. 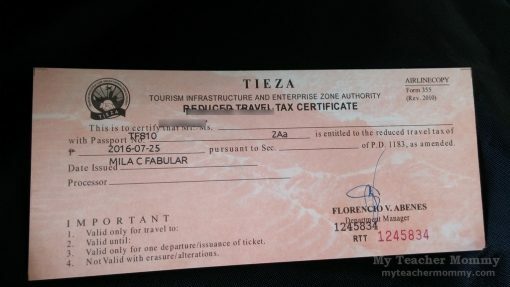 I don’t know about you, but I’d rather obtain the reduced travel tax certificate from TIEZA from the get-go than try to get a refund later. 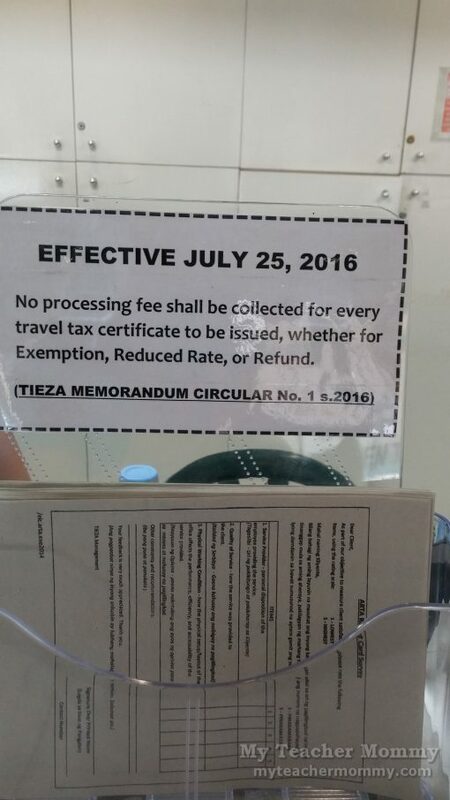 The good news is that starting July 25, 2016, TIEZA will no longer collect a processing fee (P200) for every travel tax certificate to be issued, whether for exemption, reduced rate, or refund. 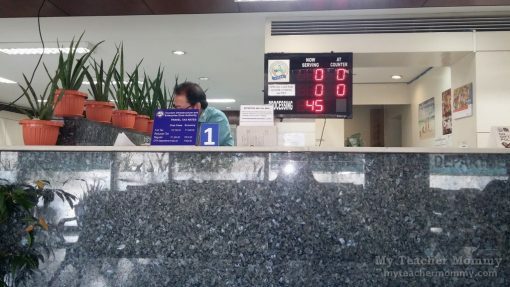 I happened to be at the TIEZA office in Makati City on the exact day that the processing fee was scrapped. Talk about auspicious timing! I’d always found P200 to be exorbitant for a processing fee, considering the only cost to them (at least, the visible cost) was photocopying passports and documents and printing the certificate. So it felt like Christmas in July when I learned I didn’t have to cough up a single peso for my son’s reduced travel tax certificate. Kudos to TIEZA for making it really more fun in the Philippines! 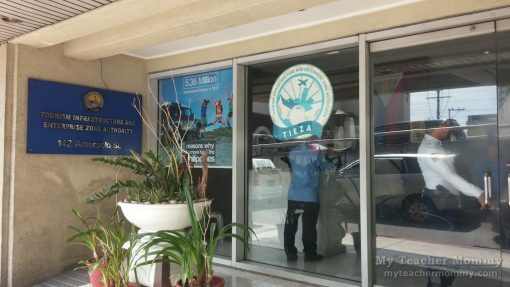 The TIEZA Makati office is located on 142 Amorsolo Street, Legazpi Village. The nearest landmark is the Makati Cinema Square (MCS). From the back of the MCS, you can walk across Amorsolo St. to the TIEZA building. The waiting area has ample seating, and the air conditioning is a welcome respite from the tropical heat. When I got to the TIEZA Makati office, there were only three other people waiting to be served. 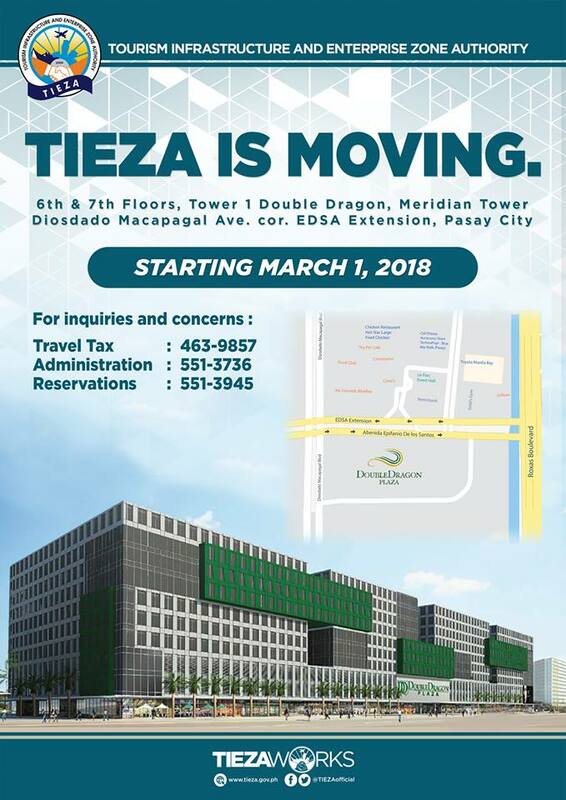 As of March 1, 2018, the TIEZA Central Office has been operating at the 6th & 7th Floors of Tower 1 Double Dragon, Meridian Tower, Diosdado Macapagal Ave. cor. EDSA Extension, Pasay City. The Makati office is now closed. The TIEZA employees went about their duties with a smile. 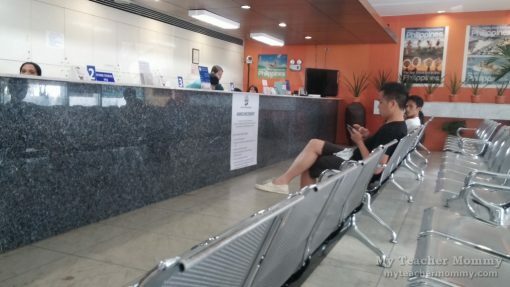 When my turn came, I presented my son’s passport for photocopying (they do the photocopying, so don’t bother bringing any) and waited for my name to be called. My bum had barely warmed my seat when they called me to collect the reduced travel tax certificate. The entire process took about 20 minutes. Next I proceeded to my airline’s ticketing office to purchase our tickets. I handed the ticketing agent my son’s reduced travel tax certificate from TIEZA. Consequently, the reduced travel tax was applied, and I was a happy camper. That’s one less queue to wait in at the airport. If that sounds like an attractive prospect to you, you can pay your travel tax online or at any TIEZA office days ahead of your flight. Keep in mind, however, that reduced tax rates are unavailable online; you can only pay the standard travel tax with the online option. 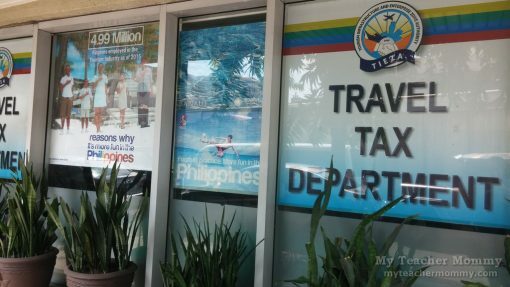 If you or anyone in your traveling party is entitled to a reduced travel tax, I suggest you make the payment personally at any of the TIEZA travel tax offices in the Philippines. Just bring your tickets/itinerary and passport with valid visa. Otherwise, be prepared to wait in line to the TIEZA counter at the airport. Hi! Who are eligible to avail the discount? My family will travel to japan for tour. Can we apply for exemption? Thanks. Hi, Meg. I suggest you read this post on the TIEZA website about travel tax exemption eligibility and this post about reduced travel tax eligibility. Those links are in my blog post, too. hi! is there any possible way to refund my travel tax since i got offloaded. i misplace the original receipt and i cant find it. no officer in terminal 1, travel tax booth assist me. on what to do. even the staff of the tigerair where i checkin, no one is assisting me. I suggest you read this link: TIEZA Travel Tax Refund to guide you on how to go about getting your refund. Good luck. Only the white copy or Original receipt will be honored by TIEZA to refund your P1620. do birth certificates, marriage cert and OeC of husband need to be presented po at the tieza counter sa airport po? thank you po. Please read this page from the Tieza website for more detailed information. Hi. Can i request tax exemption certificate at the airport on the day of my departure? I do not have time to go to their office in Makati. Thank you. Yes, you can, at the TIEZA counter. This is exactly what I did when we went to Hong Kong earlier this month. Thank u. That’s my question too since we are bound for hongkong and canada this Nov.
hi our flight is on april 30, can i pay our travel tax before the date of departure? or is it required to pay on the date of our ticket? thank you. Hi, Olen. You may pay your travel tax at any TIEZA office before the date of departure. Is there a senior discount for the travel tax and terminal fee? Hi wala po ba hassle if I request for the tax exemption certificate sa airport po same day sa araw ng pag travel? No hassle at all. Just the extra time you’ll have to set aside to stand in queue to the TIEZA counter. The queue is longer at Terminal 3 than at the other Terminals. Uhm have you tried it online po? Thank you so much. This is very informative. I’m not sure if you could answer my question but I’m dual citizen. (Phil. Passport and German passport holder). I studied here in the Phil. But since I stayed about 4 years and going back to Germany this June. I’ve to pay the travel tax but is it still possible for me to apply the travel tax exemption at the airport on the day of my departure? Wala ba utak gorbyerno natin? And matitipid mo lang sa reduce travel tax is around P800 and yet ang hinahanap nilang requirements are original passport, original birth certificate, OEC certificate, my autheticated pa ha? di nyo ba alam magkano lahat yan mga BOBO?. Magkano magagastos mo mga bobong requirements tapos P800 lang ang discount? pamasahe mo pa at pagkain pagpunta dun? magkano ang mtitipid mo P300? 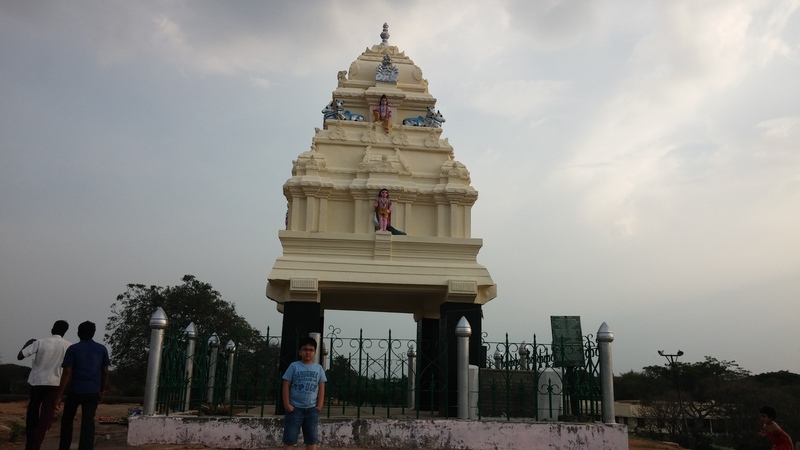 Hi good day.i purchased our ticket online with my nephew (6 yrs old) travelling with me.what’s the best thing to do? -should i get the reduced travel tax on the airport before we arrive? Ahead of time. I hope my reply’s not too late. Hello. Should i have to get travel tax exemption certificate(10 months old) first before purchasing the air ticket? I’m not the one who will purchase our air ticket so how to let him know that our baby have tax exemption? Thank you. You may get the travel tax exemption before purchasing the air ticket. Yes you may. Bring the necessary documents. Hi, Please can I ask how the travel tax process works at the airport. Flying from Manila. We have purchased ticket through Air Asia, and purchased travel tax included in the ticket price. We don’t have checked bags, so we will use online check-in and go direct to gate. Where do we have to show that travel tax has been paid…passport control? How would we show that travel tax has been paid… something on the boarding pass? I really don’t know how they interpret the law. Hi, I’ll be traveling with my two 7-year old sons in February 2018. I am very busy and I don’t have time to go to teiza makati office. Can I just apply for the reduced travel tax certificate at the airport on the same day of our departure? Have you already tried it? If so, was it easy? Thank you. Yes you may apply for a reduced travel tax at the airport. I’m sorry, but I’ve no idea. Better ask the TIEZA office. Magpaflight po kami sa april 12 2pm cebupacific po..
Panu po ako magaapply para sa tax exepmtion nila? Okay lang po ba na ahead of time before the departure? hi!sorry .tama ba na sa airport meron Tieza counter to give us the tax exemption certificate for a 1yr-old child and resuced tax certificate namn for a 3-yr-old child?ang gulo kasi ng CS ng CebPac na nakausap ko. Sbe nya need to go to Makati office pa.Otherwise,Ill pay in full for 2children. Pasensya na po late na ito. Siguro po naka-travel na kayo. Busy po ako sa online job ko. May Tieza counters na po sa lahat ng airports sa PH. Where is your new Tieza office? My come to your Amorsolo office but you already vacated anymore branch of tieza we can go to apply for reduced tax for OFWs dependent, bec. My 12 y/o daughter is going to travel alone this coming Thursday and still weren’t yet finish with it. 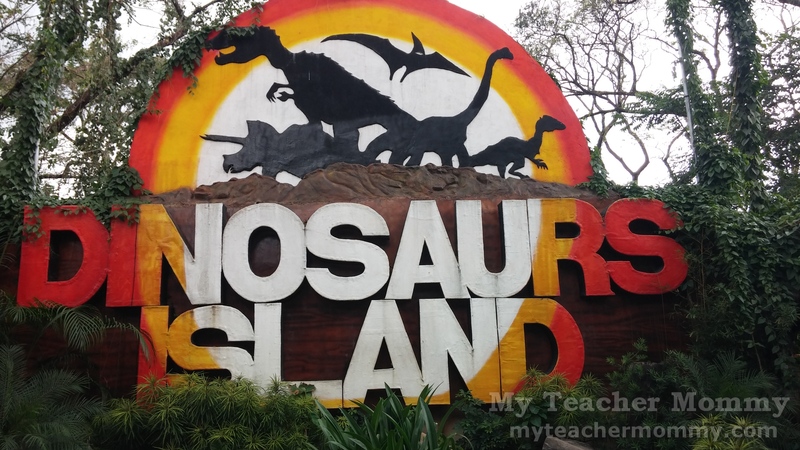 hi im an ofw and my parents are going to visit me in singapore, can they avail the discount? Hello po, is the original marriage certificate signed during the wedding accepted? Or a copy from PSA will only be honored? Also, will the requirements be collected or just needed for show? Please advise ASAP. We will be traveling next month already. Thank you. PSA copy is sufficient. They might photocopy the PSA marriage certificate and passport information pages if you have not brought any with you. At least that was my experience and your mileage may vary. Hello po. Ask ko lang if entitle kami ng son ko for privilege reduce travel tax. OFW ang husband ko and ang last OEC na issue sa kanya ang last Oct. 2014 pa. Bale sa Taiwan na sya nag renew ng contract nya same employer. di pa siya nagbakasyon ulit sa Pinas until now. Pwde ko bang ipresent sa TIEZA yung OEC nya last 2014? Hi, how can we from the province avail this?